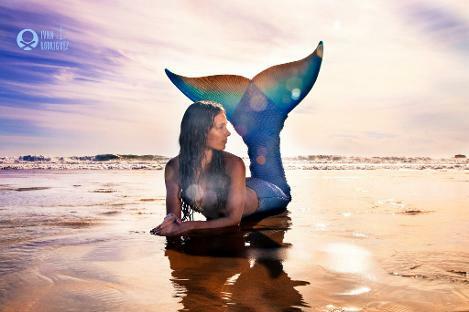 The International Mermaid Academy was created by Holly Bishop ( Gypsy MerMama ), in 2014 after offering mermaid swims from her business SUPnorth Paddle Board Adventures in 2012 & 2013. Holly and her husband, 3x Mexican Longboard Champion and BluWave SUP Team Rider, Pablo Bonilla, spend their summers in Haliburton, Ontario, Canada, where they teach Stand Up Paddle Boarding with their business SUPnorth. Holly has always loved the water and has spent her life playing in lakes and oceans; surfing, paddling, swimming and being a mermaid! In 2012 Holly and her daughters got real mermaid tails and began to offer classes in beautiful Eagle Lake! This took off and Holly became know as Canada's professional Mermaid offering classes threw her business SUPnorth and then creating the International Mermaid Academy! "Mermaiding" has since become a popular activity and the International Mermaid Academy is the leader in establishing regulations and standards for mermaid instructing in North America. We have created a Mermaid Instructor Certification Course to ensure you have the best and safest mermaid experience ever! We offer Mermaid classes, workshops, Instructor Certification Courses, MerFit classes, Birthday and Bachelorette Parties, Retreats and more! In the winter months we take our mermaids down south to beautiful Baja, Mexico with BajaSurfSUP! We are currently offering our services in Souther Baja, Mexico from La Paz- Los Cabos, and all over Ontario Canada! Contact Us to bring a Mermaid Adventure to you! Gypsy MerMama in her tail by The MerTailor, Eric Ducharme . Gypsy Mermama Photo Shoot in Baja Mexico.